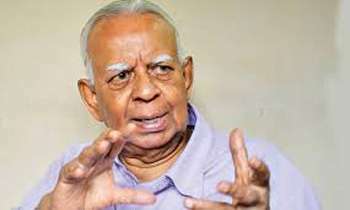 The Tamil National Alliance (TNA) had urged the diplomats in a meeting held yesterday to use their influence with whoever necessary to set things right and put the country in the right path, Tamil National Alliance (TNA) leader R. Sampanthan said. The TNA had a meeting at the Opposition Leader’s office with the fifteen members of diplomate community to discuss matters pertaining to the prevailing political crisis which initially started on October 26 this year. Diplomats from US, UK, Canada, Norway, Switzerland, EU, India, Korea, Bangladesh participated in the meeting. Addressing the media after the meeting, he said they discussed how the then Prime Minister was removed, how the new prime minister was purportedly appointed, how Parliament was prorogued and dissolved and interim order of the Supreme Court suspending the dissolution of Parliament.